"You know, I believe we have two lives...the life we learn with and the life we live with after that." Hollywood, like America itself, has a love affair with baseball. It is, after all, America's Game. From The Pride of the Yankees to Bull Durham, from The Bad News Bears to Field of Dreams, we have laughed and cried and cheered and hissed at the exploits of baseball players on the silver screen. 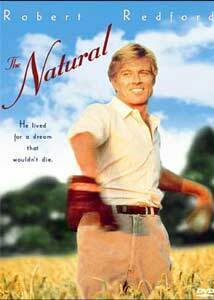 1984's The Natural figures prominently in the cinematic history of baseball. When we first meet Roy Hobbs, he is just a boy playing catch with his encouraging father. His talent, even at a young age, is unmistakable. But his father cautions him: "You've got a gift, Roy, but it's not enough. If you rely too much on your gift, you'll fail." Tragedy soon strikes, with his father dying of a heart attack, and Roy is left without his mentor. On the night of his father's death, a lightning bolt from an electrical storm strikes and splits a tree outside Roy's window, the tree that his father stood near when he fell. The next day, Roy cuts the heart from the remaining stump and begins to make a bat. Once completed, he etches "Wonder Boy" into the bat's shaft. Fast forward sixteen years and a much older Roy Hobbs walks into the dugout of the last place New York Knights. He has just been sent up to the team by the team's scout. The team's manager, the curmudgeonly Pop Fisher, is absolutely incredulous at the middle-aged rookie his scout has sent him and, despite Roy's contract, at first refuses to play him. When a tragic accident leaves a hole in Pop's lineup, Roy finally gets his chance and he shows both Pop the world the greatness that he possesses. All will not be easy for Roy, however, as he must overcome obstacles on and off the field. The Natural features an allstar cast. In the leading role is Robert Redford, a man who has never really impressed me with his range. He has a tendency to play the same character, albeit very well, in many of his films. In my honest opinion, his soft-spoken and introspective Roy Hobbs is no exception. The real gems here are Glenn Close as Iris, his boyhood sweetheart, Robert Duvall as Max Mercy, Wilford Brimley as the grousing old Pop Fisher, and the late Richard Farnsworth (his last film was 1999's The Straight Story) as Red Blow, Fisher's thoughtful assistant manager. Most of the film's remaining roles are one-dimensional, filled by the likes of Kim Basinger, Darrin McGavin, and Robert Prosky. Many fans back in 1984 bemoaned the relatively small number of Oscar�® nominations that The Natural received. Among the actors, only Glenn Close was recognized with a Best Supporting Actress nomination. Director of Photography Caleb Deschanel, whose other work includes Black Beauty, last year's The Patriot, and the modern sequences in Titanic, was rewarded with a well-deserved nomination for his beautiful cinematography. Also well-deserved was Randy Newman's nomination for Best Original Score, and Mel Bourne, Angelo P. Graham, and Bruce Weintraub for Art Direction. Frankly, I tend to think the film received the nominations it deserved. Against other powerful films of that year, such as the ultimate Best Picture winner Amadeus and The Killing Fields, The Natural is rather schmaltzy by comparison. The film is a rather loose adaptation of Bernard Malamud's dark, allegorical novel of the same name. Malamud looked to the 1949 attempted murder of Philadelphia Phillies first baseman Eddie Waitkus and to the medieval Arthurian legends for inspiration (Hobbs' bat "Wonder Boy" can be compared to Excalibur, the team is named the "Knights"). His novel is haunting, multi-layered, and intelligent and was considered by many to be unfilmable. Screenwriters Phil Dusenberry and Roger Towne proved this estimate wrong. However, the film was widely criticized by fans of the novel as being a typical dumbed down silver screen adaptation. These criticisms are certainly not without merit, as it happens. Most of the allegorical elements are stripped away, the ending was changed, and many of the central characters have become mere caricatures in the adaptation. To be fair, The Natural rates well when judged on its own merits and not against the novel from which it sprang. While certainly a bit formulaic and watered down, it succeeds admirably in being a moving look at a man who arrives at his pre-ordained destiny of greatness sixteen years late. It also takes us back to a time when baseball truly was America's pastime and not just big business. The film will likely move you, make you cheer, and lighten your step, even if it doesn't make you think all that much. Image Transfer Review: The Natural was filmed over seventeen years ago and it comes as little surprise that the image tends to look its age. While the anamorphic transfer features nice colors and graininess that, with one or two exceptions, does not distract, overall clarity and sharpness is lacking. Blacks are deep but shadow gradation is generally lackluster. Edge enhancement is, at times, apparent. Source element artifacts, as one would expect from a print of this age, do show up with some prominence but their presence is rarely distracting. While certainly not impeccable, this is a fairly good visual presentation of an older film and almost certainly the best it has ever looked on home video. Audio Transfer Review: While originally shown in stereo, The Natural has been remastered into both Dolby Digital 4.0 discrete surround and 2.0 surround tracks. Fidelity on both spends an overwhelming majority of the time residing in the upper half of the sound spectrum. The front soundstage is well utilized to add richness to the audio and Newman's score sounds quite good emanating from both front and rear surrounds. As with many remasters of older mono or stereo tracks, ambient surround channel usage is inconsistent. When it counts most, such as during the many baseball scenes, the surrounds come alive with the noises of the crowd providing a pleasing auditory experience. During other scenes, such as during Roy and Memo's late-night seashore stroll, the surrounds remain completely silent. While the French language track seems to be a reasonably high-quality stereo track, the Spanish and Portuguese tracks are very poor 2.0 mono tracks. You would be far better off listening to the discrete surround English track and using the included subtitles. Extras Review: The primary supplement included with The Natural is a very good 44-minute documentary featuring future baseball Hall of Famer Cal Ripken, Jr. Interlaced with footage from the film and additional interview footage with director Barry Levinson. Ripken uses the film as a relational vehicle for talking about his experiences in baseball. If you are a Ripken fan (living near Baltimore, I am required by Maryland law to be one) or even just a baseball fan, this is a very nice extra. Unfortunately, the documentary is nonanamorphic widescreen and tends to be rather dark in contrast. Three trailers are included with this disc; The Natural, The Way We Were, and Bugsy. All three are nonamamorphic. Cast filmographies and production notes/source material in the insert round out the supplements for this disc. I feel compelled to mention that the static menus on this disc are exceptionally slipshod low-resolution scans. This is a minor drawback but worth mentioning. While liable to be a disappointment to fans of the Malamud novel that inspired it, The Natural is a moving and beautifully photographed story of a man's postponed intersection with greatness.